Much of the West Coast of New Zealand that we saw was wild and rugged with cliffs going down to the sea. 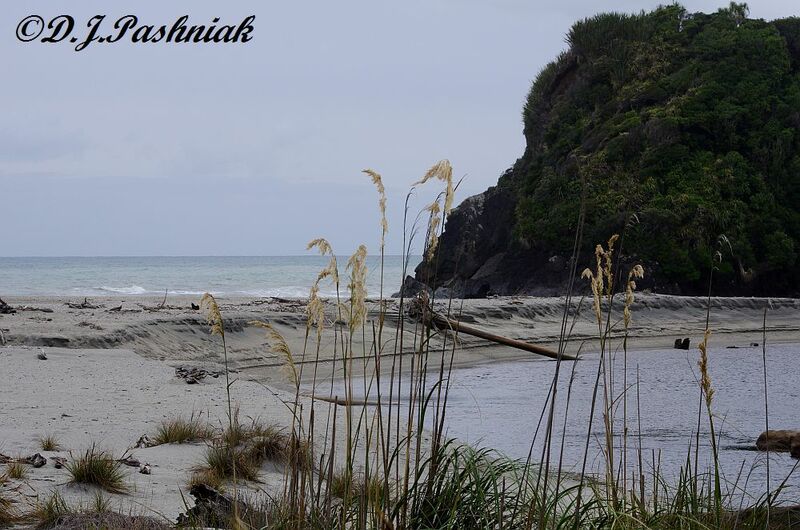 There were also places like this, where a little stream came out making a small lagoon behind the sand. The tall plumed grasses we called Toe toe when we were children, but there is also a similar plant - Pampas - which has been brought in from overseas and has become a pest. Upstream there was a track around the wetland. 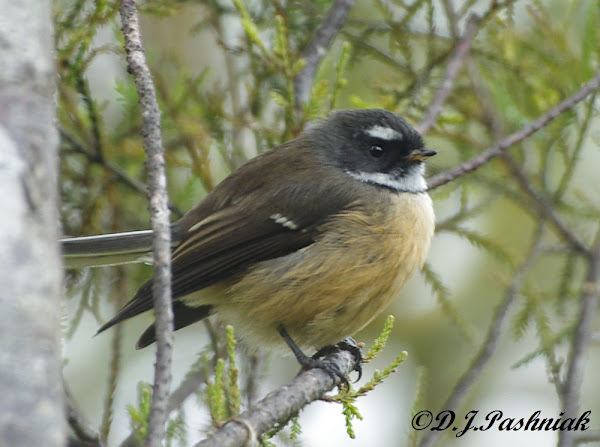 Birds called all around but the only one I got good views of was this New Zealand Fantail. It's Maori name is Piwakawaka. The trip from Wanaka through the Haast Pass to the west coast was like nothing else we had seen thus far. 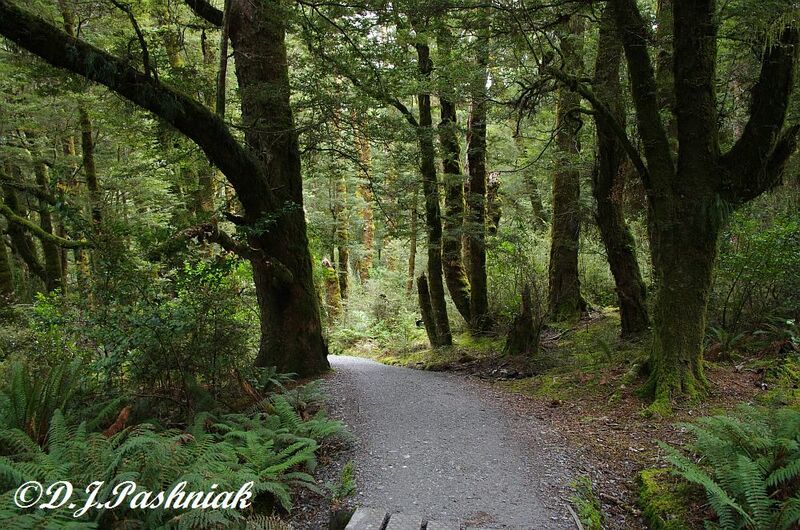 First the road gradually traveled up a valley until we were high enough to be in forest country again. 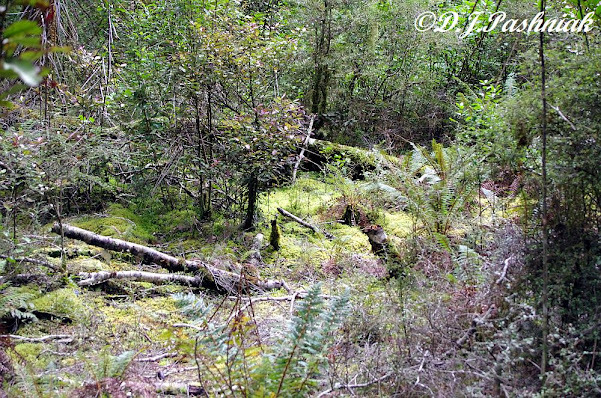 This was true rain forest and there were numbers of marked tracks and interesting sights along the road. Each was well sign-posted so if you didn't want to see everything it was easy to pick what you did want to do. We walked into the rain forest down a well-made track. 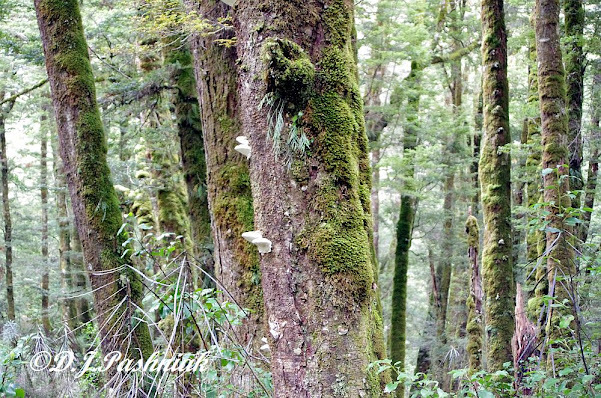 This looked and smelt like the forests we knew when we were children growing up in New Zealand. 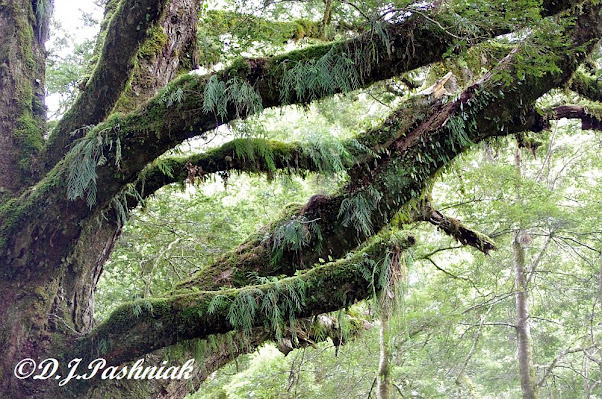 We loved the moss and ferns on the ground and hanging off everything. As the road started to descend on the other side of the Pass we came out into a little valley with a stream down the middle. There was a picnic area and camp ground here. 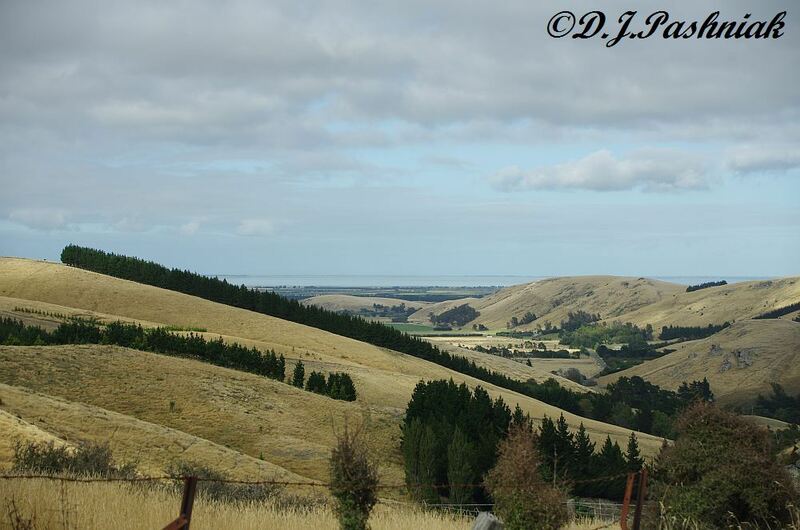 In the foreground of this photo is a row of New Zealand Flax plants. This is quite a different plant from the flax of the northern hemisphere but because of its fibrous leaves it was given a similar name. From here on the road got steeper and more windy. 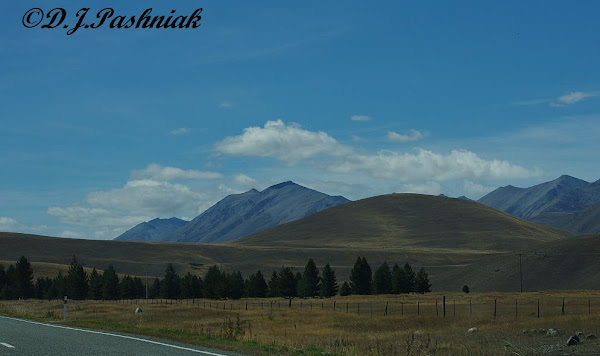 When we toured the south island of New Zealand with our parents all those years ago we remembered that Dad did not want to travel over this pass so we went further north and went over Arthur's Pass. Driving this road this time we did wonder why - but then read one of the tourist notices that said this pass was only officially opened in 1960. It was Christmas of that year that we had been here. I am sure that the road would not have been sealed back then (very little was!) and it must have been pretty hazardous after rain! Even now the only bridges were all one way and there were notices with arrows showing which direction had right of way. All the notices said that heavy traffic had to slow down to 20 km (just over 12mph). This bridge is at a place called the "Gates of Haast". Even when we got down to sea level most of the bridges were still one way only. One of the longest ones over a wide shingle river even had a passing place in the middle of the bridge. 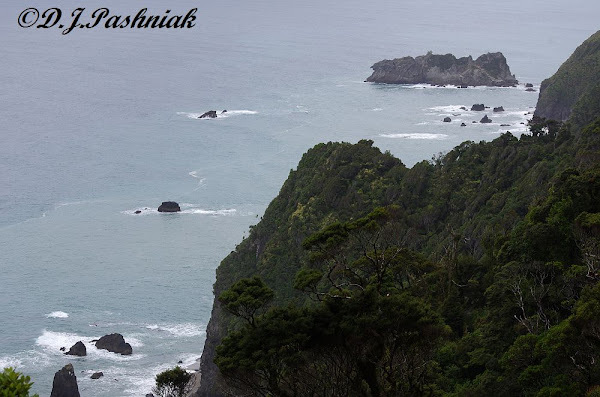 More about the west coast next time. 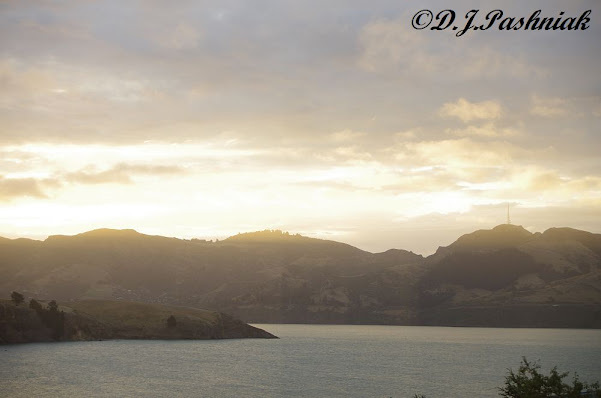 This post really should have been added in to Part 4 of our New Zealand trip. I was going to omit it entirely but looked back at my photos and decided they were too interesting to just leave out. 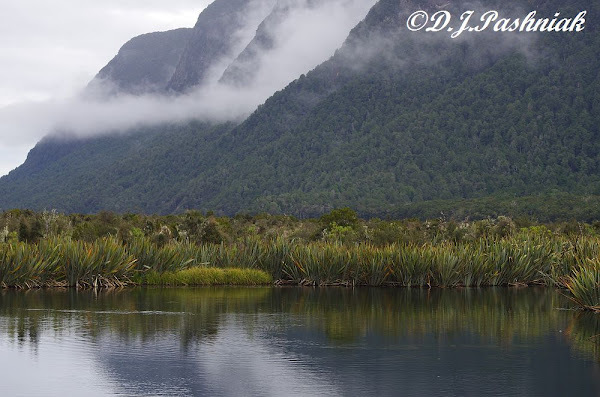 Mirror Lakes are on the road from Te Anau to Milford Sound. They are only a few steps off the road and there is a well-made board walk along the water's edge. On a clear and still day the reflections in these little lakes are said to be very beautiful. However, the day we were there it was raining most of the time and grey. 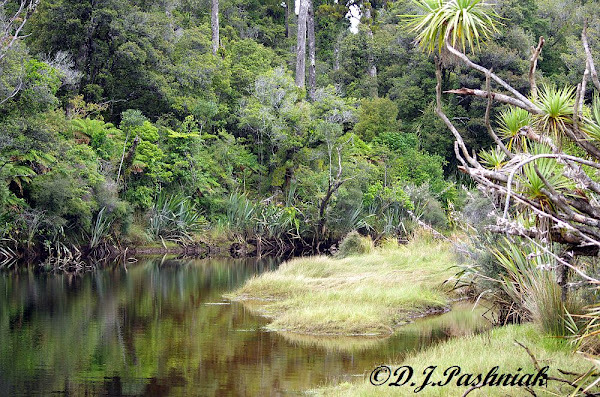 Only the parts sheltered from the breeze reflected back the close vegetation but the colors of the water and the vegetation were very beautiful. 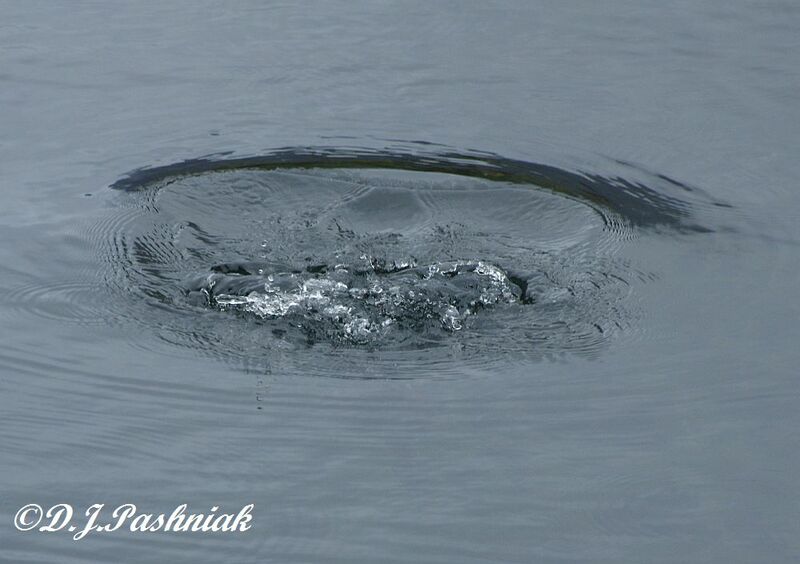 There were numbers of ducks on the water. 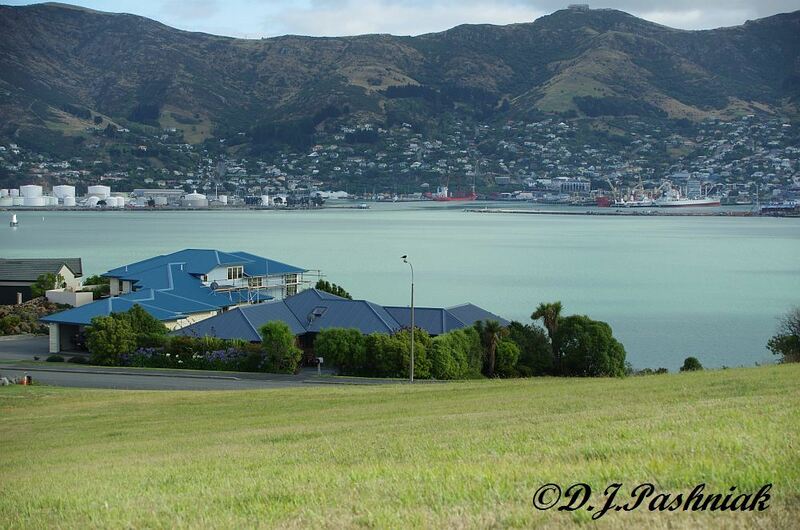 (If I am wrong with these ID's will some New Zealander correct me please!) 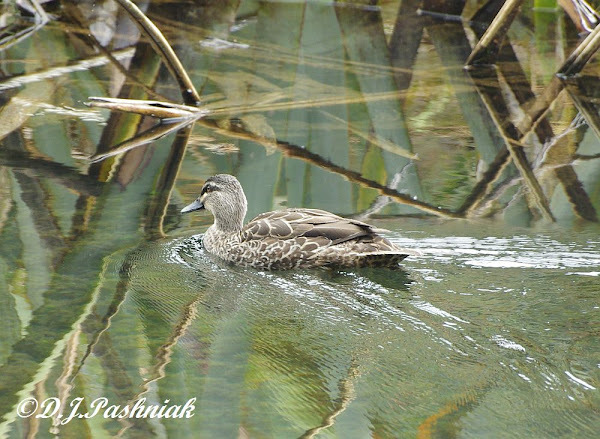 This is commonly known as a Grey Duck and is a sub-species of the Pacific Black Duck which we have in Australia. It's Maori name is Parera. Unfortunately it is listed as threatened because of loss of habitat and competition from introduced Mallards. Mallards also interbreed with these ducks and the Mallards are dominant. 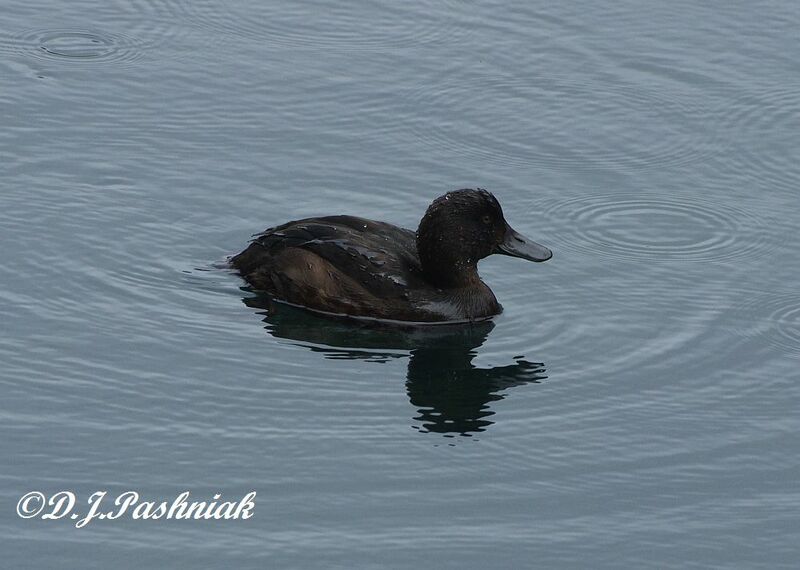 This is a diving duck - the New Zealand Scaup. 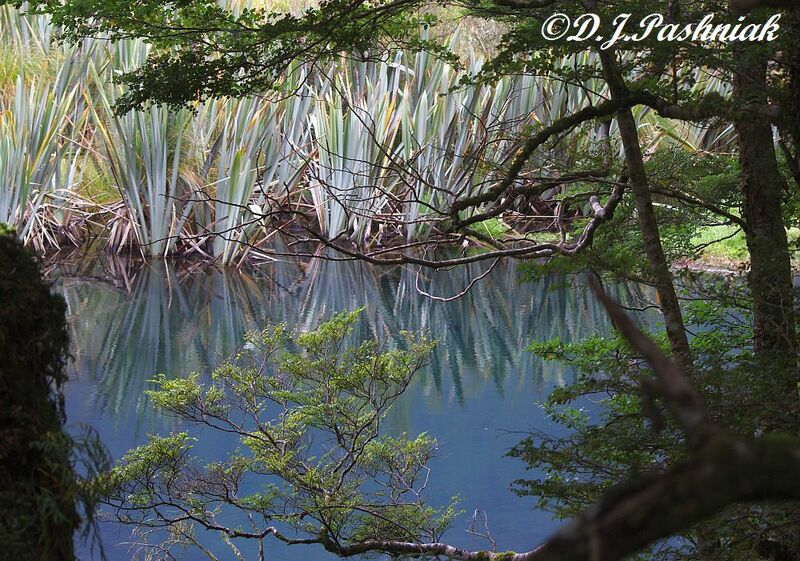 It's Maori name is Papango and it is sometimes called a Black Teal. I had a hard time getting a good photo and pose - every time I thought I had one nicely arranged in my view finder it dived out of sight! 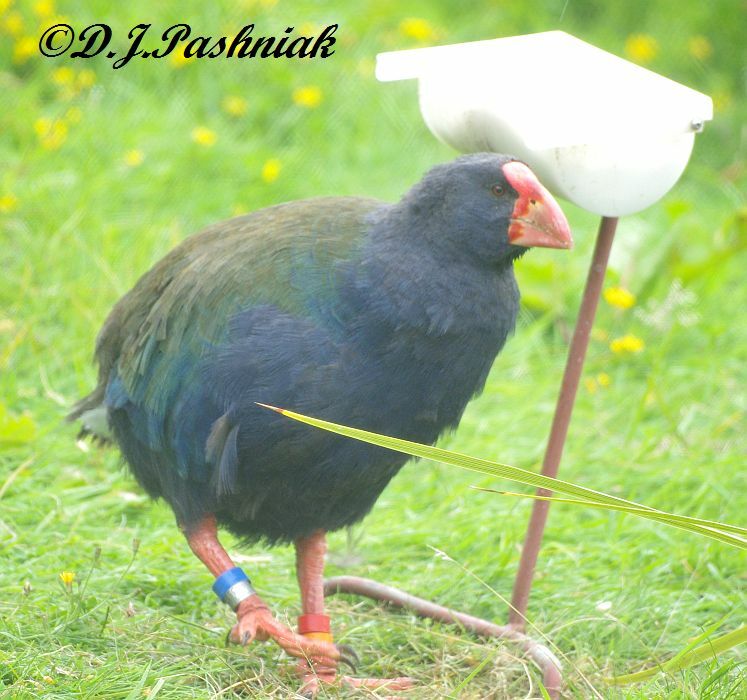 Every country has some special birds and New Zealand is no exception. I was fortunate to see some of them - and unfortunate to miss some of the birds I remembered as fairly common when I grew up over there. As we waited at the Homer Tunnel to drive through to Milford Sound a Kea came to investigate us - but it was only just getting light and we were in a hurry to get to our cruise on time so I didn't even try for photos. Later on while we were at Fox Glacier on the west coast I was lucky to see another one that certainly didn't mind posing for my camera. 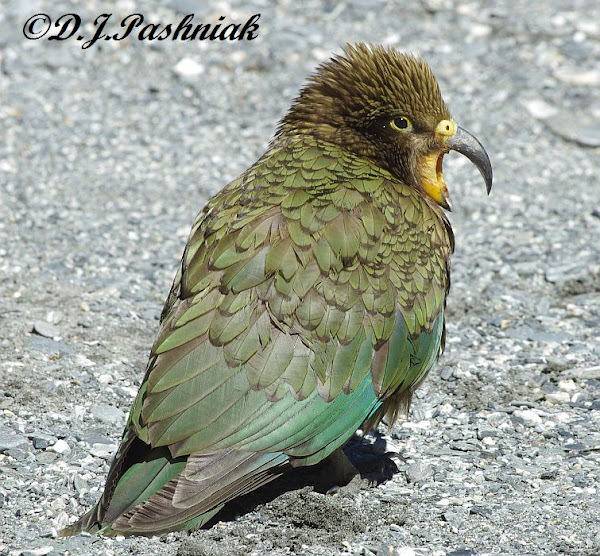 Kea are only found in forested and Alpine areas of South New Zealand. They are about 48cms or 19ins long. They are intelligent, inquisitive and very destructive. Scientists studying them found that they can quite easily master 2-part puzzles to get to food rewards. They can also master puzzles that require two of them to work together. We remembered one coming and sitting on the front of our car when we were children traveling with our parents all those years ago. It was attracted by some of the picnic our Mum had rested on the dash just inside the front windscreen. We children were delighted - but our Dad was much less so when the bird started pulling the windscreen wipers apart! The one we saw this time at the Fox Glacier was attracted by some people in the parking lot who were resting in chairs outside their camper with things scattered around on the ground. It then marched around looking for whatever might be in reach. 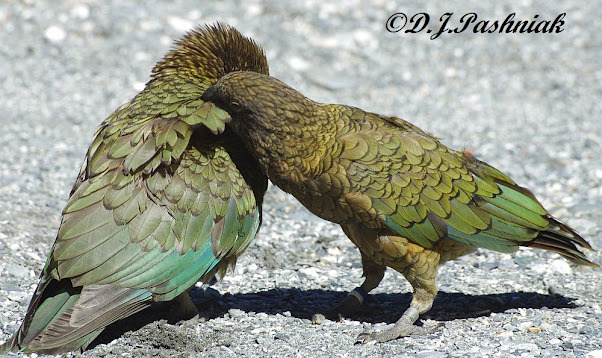 It even put on a display preening what appeared to be its mate. And finally demonstrated just how loudly it could scream. The only thing we did not see was the beautiful orange color under its wings. 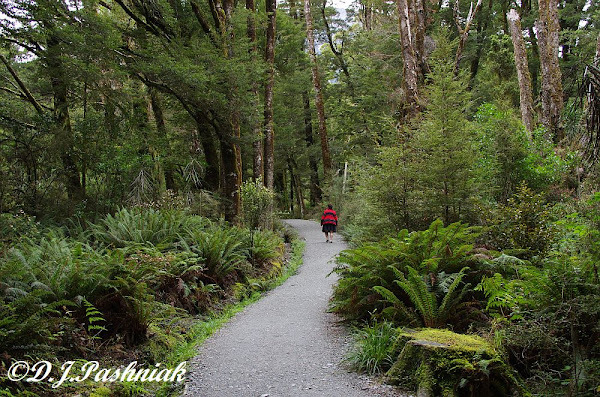 The Takahe is a large flightless bird belonging to the Rail family. It is 63cms or nearly 35ins long. There were four birds taken from the wild in 1898 and then no more seen for 50 years. It was assumed to be extinct but then in 1948 some were found in mountainous country in Fiordland in the South Island. Now, they are being bred in captivity and released into the wild. However, once again, it is a very slow process and there are only about 220 known birds today. 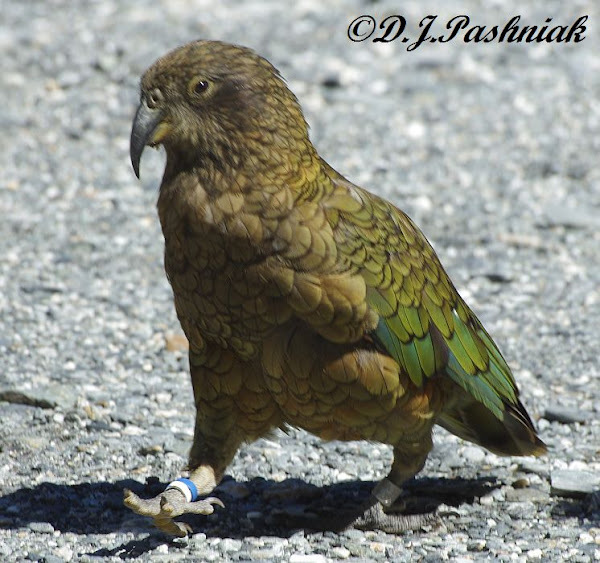 The ones I saw and photographed were in the wildlife center run by the Department of conservation at Te Anau. It was raining while I was there and I was photographing through the wire of the enclosure so the photos are not good quality but I was pleased to even see these birds and getting photos was a bonus! We traveled past most of these lakes as we went south to Te Anau and Milford and again as we went north to Wanaka. Going south the weather was fine but dull but going north the early morning promised a fine and sunny day. We did rather think it was a bit chilly when we were packing the car to leave but it was after traveling a little while that we saw there was a fresh dusting of snow on the hills and mountains. It was beautiful! It looked just as if someone had taken a shaker of icing sugar and dusted all the tops of the hills. Only those who live - like us! - in the tropics will understand that this is a wonderful sight! 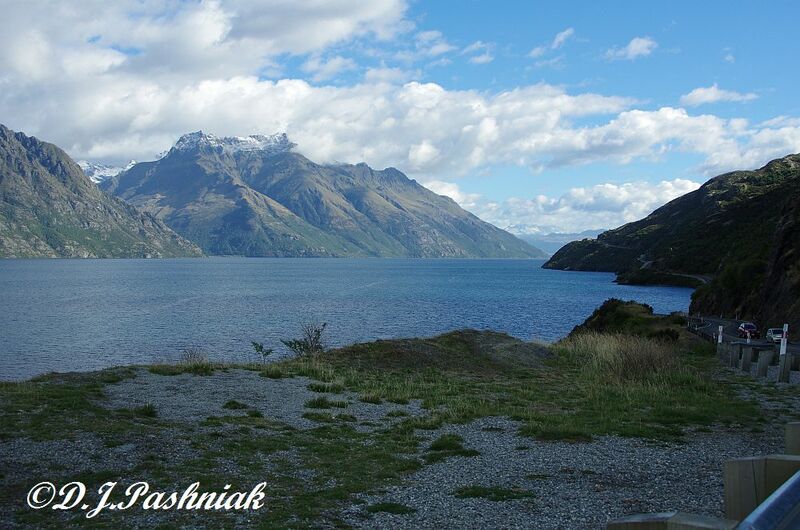 We traveled along beside Lake Wakatipu which is 80 kms or 50 miles long. It is also very deep - 420 Meters or 1380 feet at its deepest part. Lake Wakatipu is New Zealand's longest and third largest lake. 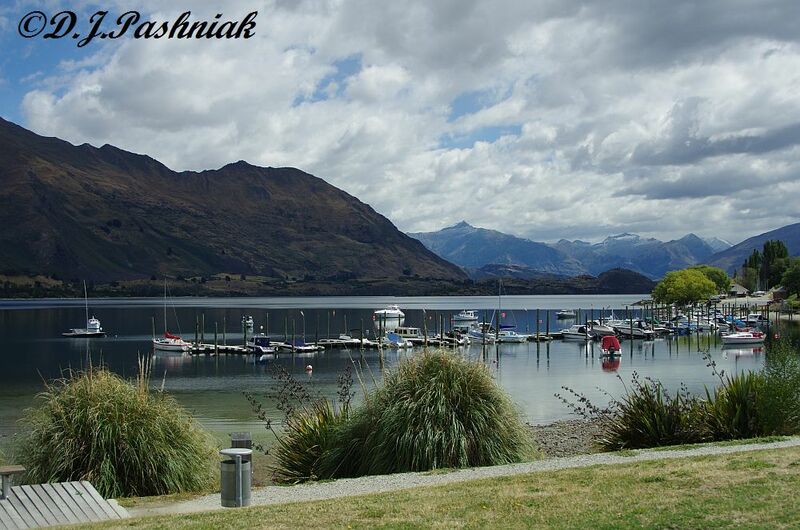 Queenstown is at the northern end of the lake. The Kawarau River drains the lake. 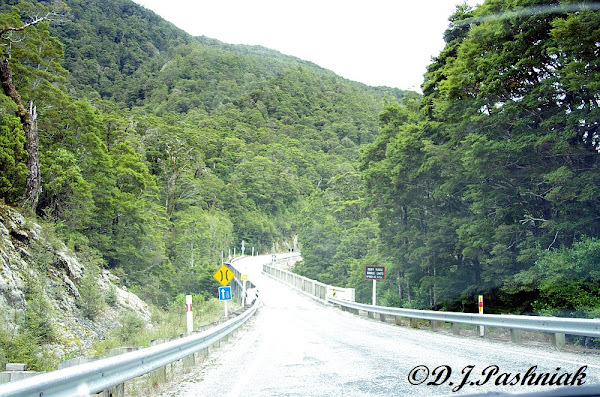 The scenery all along this route is very beautiful but the road is very windy. You certainly can't speed but who would want to speed past scenes like this! The area around Cromwell and Lake Dunstan is known for its stone fruit orchards and vineyards. 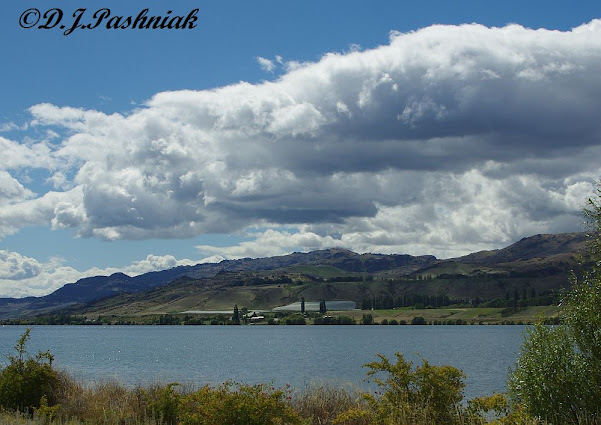 Lake Dunstan was made in 1992 when the Clutha River was dammed. 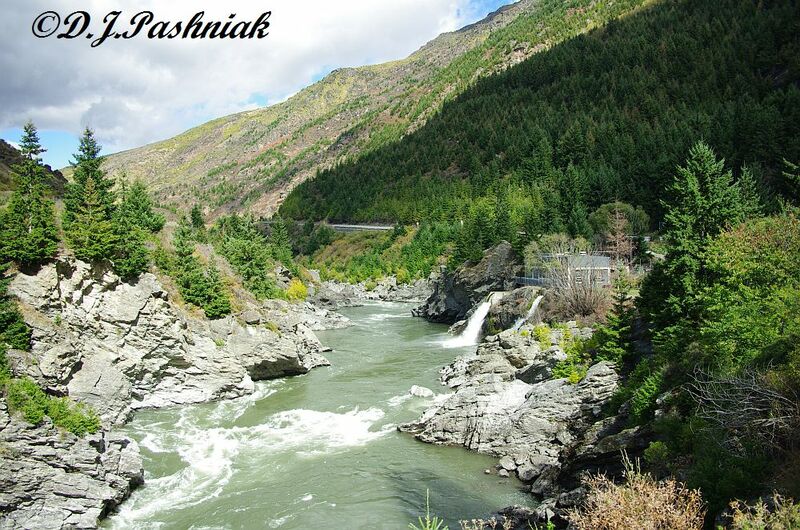 Today it provides irrigation water and hydro-electricity but the filling of the lake changed the landscape forever. Most of the vineyards and orchards are netted to protect them from birds. The large white patches across the lake are netting on vineyards. 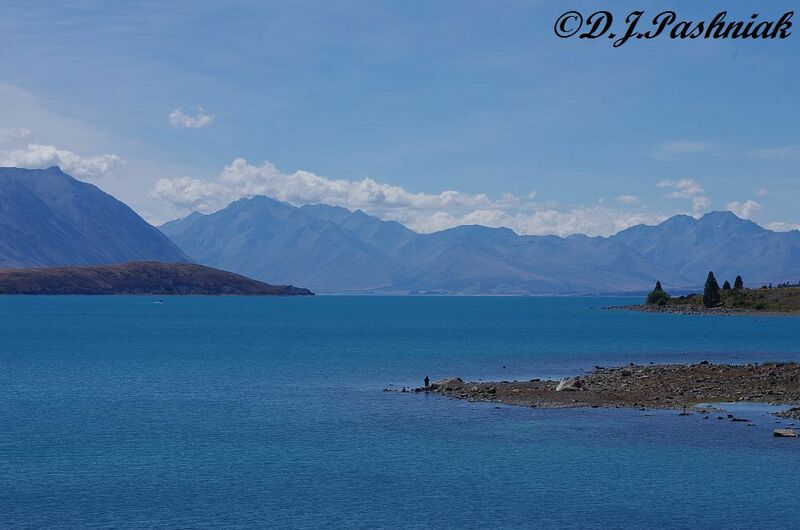 From here we turned west to Lake Wanaka. 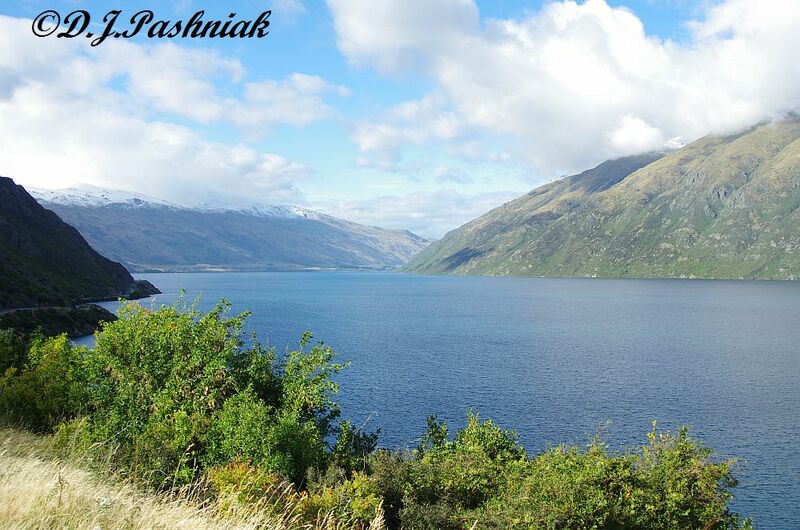 This is New Zealand's fourth largest lake. 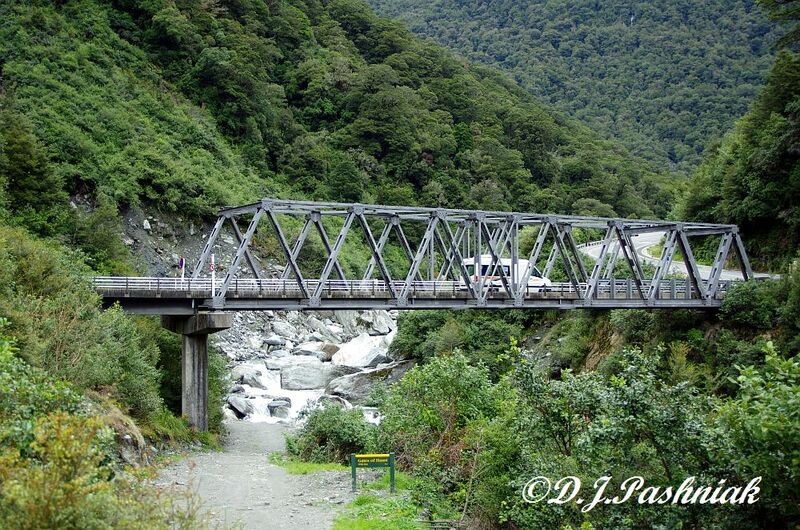 The trip from Te Anau to Milford Sound was wet! Of course that's hardly surprising when Milford Sound has rainfall that is easier to express as feet than inches! One of the sources I looked at quoted 6,813mm or 268ins. It is definitely the wettest place in New Zealand! All I can say is - it could have been worse! Most of the time out on the Sound the rain was not really heavy but it certainly meant that I did not get the 'picture postcard perfect' photos I had hoped for. 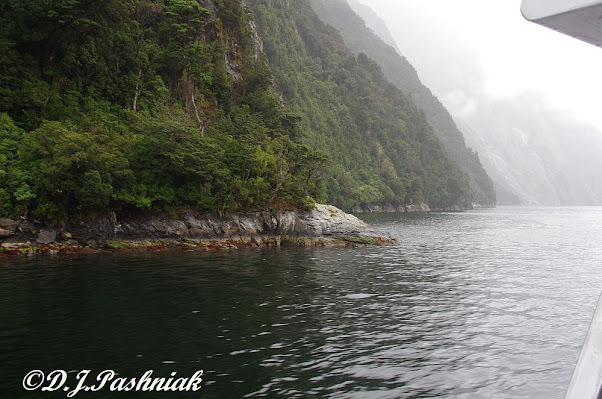 We had booked a 2 hour trip with Milford Sound Cruises. They had slightly smaller boats and we thought this might be more fun with fewer passengers. We also decided to take the first trip of the day which left just before 9am. Book-in was half an hour before this and the drive from Te Anau takes 2 hours so it was an early start. It was well worth the effort when we discovered there were only 8 other people on that first cruise of the day. It was lovely to be able to wander all over the boat and view things from both sides without displacing other passengers from their positions. The mountains on both sides of the Sound were covered with mist and low cloud so my best photos were those that showed the closer views. 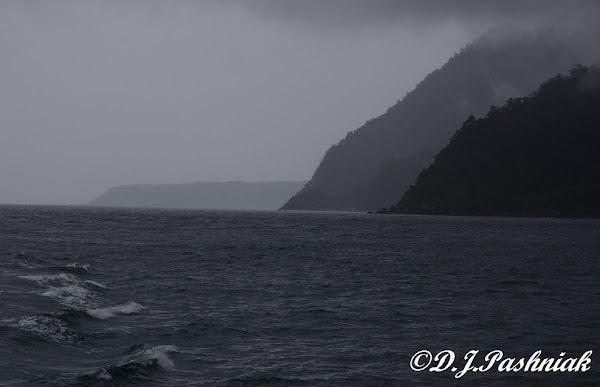 This particular boat also takes you right out to where the Sound goes out into the ocean. None of the other boats that we saw went out this far. I saw numbers of terns and gulls but the boat rocked and I wobbled the camera and nothing came out really clear. 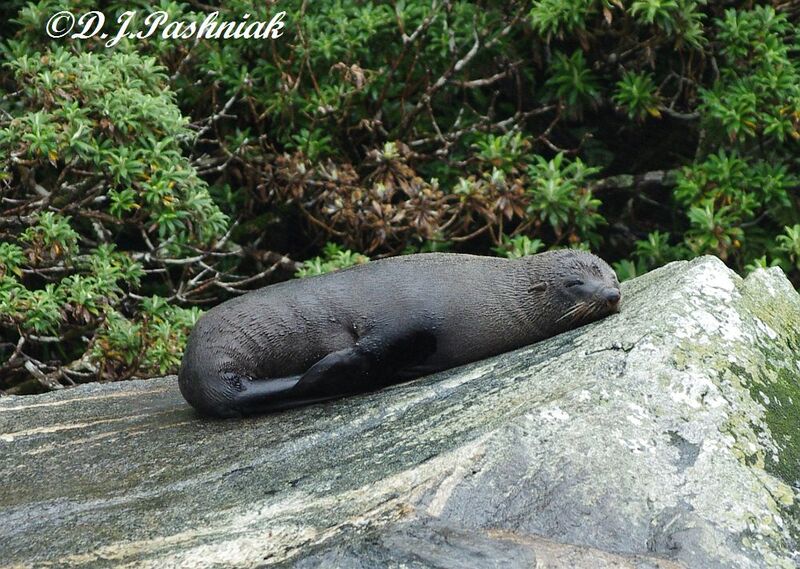 The only wildlife that was really clear was this seal that was resting on one of the big rocks at the side of the sound. In places the rocks went straight up from the water and they were too steep for anything to grow on them. However, wherever there was enough room for a scrape of soil there were plants growing. 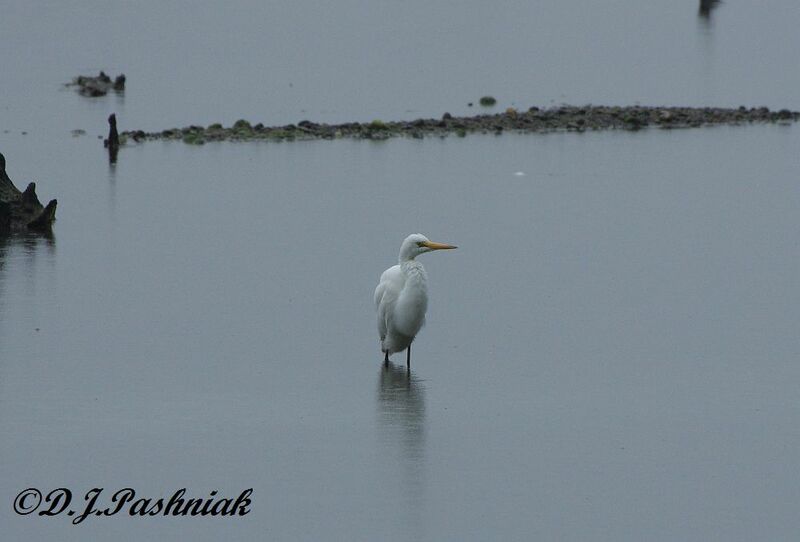 It was raining even heavier when we got back to land but as I was walking back to the car-park this White Heron or Kotuku (which is the Maori name for this bird) was wading in the shallow water. I covered the camera and did the best I could to compensate for the low light. I had hoped we would be able to walk along some of the rainforest trails but this lost its attraction with all the rain coming down. 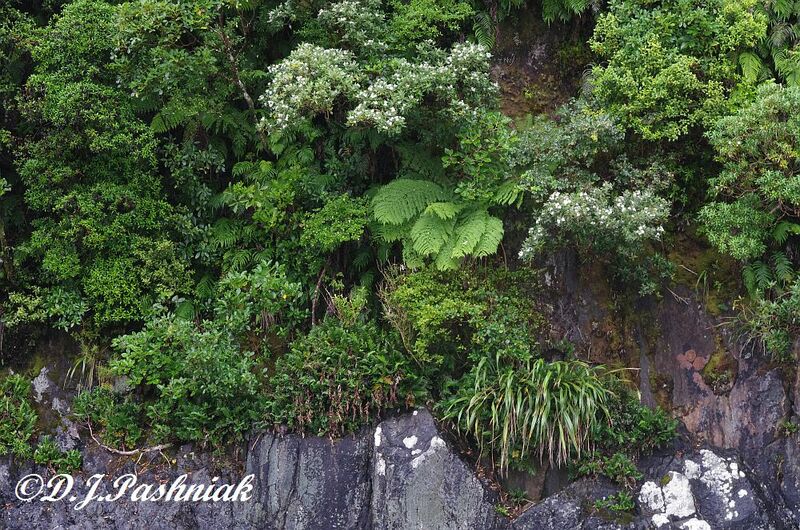 Still, there was more rainforest to see in the days ahead and I hoped for better weather! 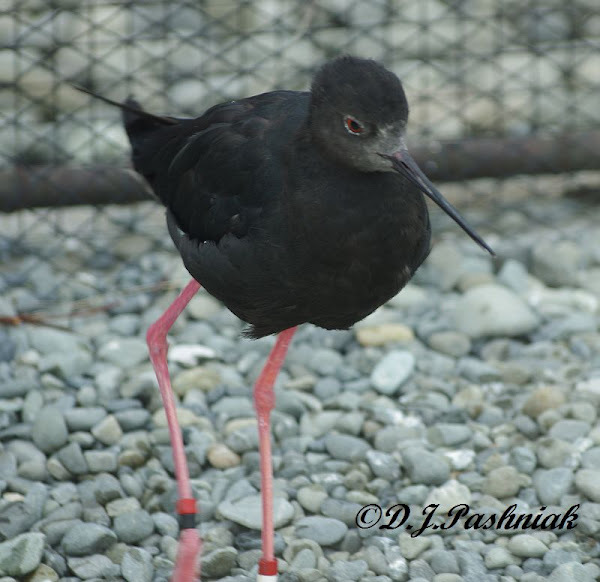 Kaki or Black Stilt (Himantopus novaezelandiae) have been called the world's rarest wading bird. 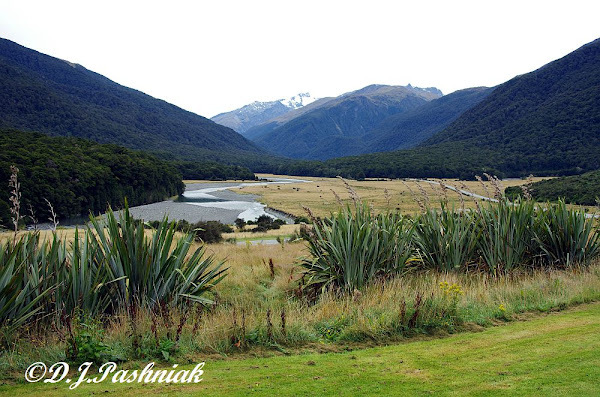 They were once common throughout New Zealand but are now restricted to the braided river channels of the Mackenzie Country. We stayed overnight in Twizel, which is just south of Mount Cook, and made arrangements for a tour of the Department of Conservation's captive breeding center the next morning. DOC began managing the remaining population of Kaki in 1981 when the total remaining population of these birds dropped to only 23 birds. We were able to see two Kaki quite close at the center. These are old birds that were previously part of the captive breeding program. All the rest of the birds were well away from the viewing hide and we had to use binoculars to see them. Kaki are completely black with long pink legs and a very long bill. 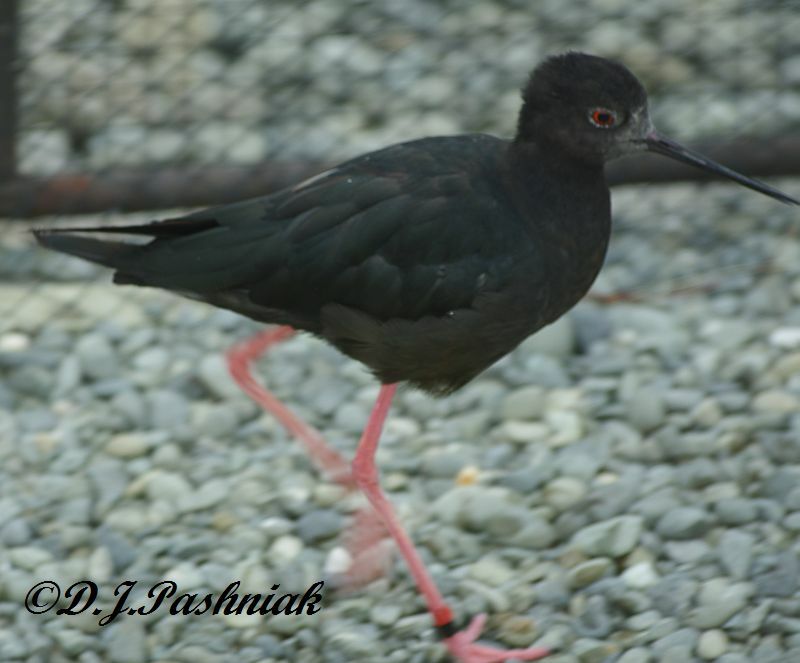 The sound they make is similar to the sound of the Black-winged Stilt. I was intrigued with the similarities between the Kaki and the Black-winged Stilt which is quite common in Australia. Black-winged Stilt found their own way to New Zealand sometime in the recent past and unfortunately for the Kaki they compete for habitat and can also interbreed. These photos were taken through the wire of the pen and with some reflection from glass panels surrounding part of the pen. Kaki face a number of threats in the wild. The biggest threats are from introduced animals such as rats, ferrets, and cats. There is also habitat loss from hydroelectric and agricultural development. 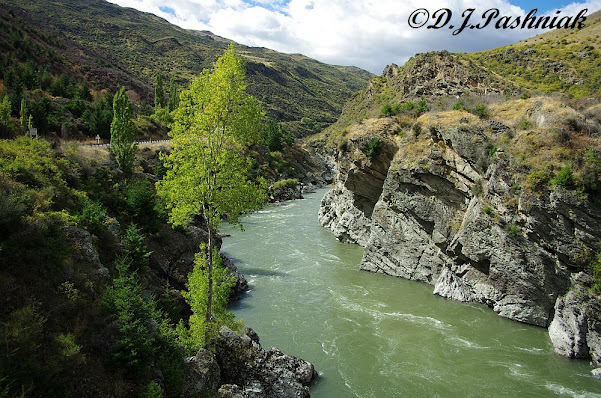 There is also human disturbance from recreational use of the riverbeds and wetlands. By collecting the Kaki eggs and incubating them at the center the young Kaki can be reared safely. They are kept until up to 9 months of age and then released back to the wild in suitable habitat. From a low of 23 birds the total population of Kaki at August 2011 was now 185 birds. An enormous amount of time, energy, and money has been needed to get the numbers back up to even this level. I can't help thinking that it would be better if we humans did not upset and degrade our environment in the first place. 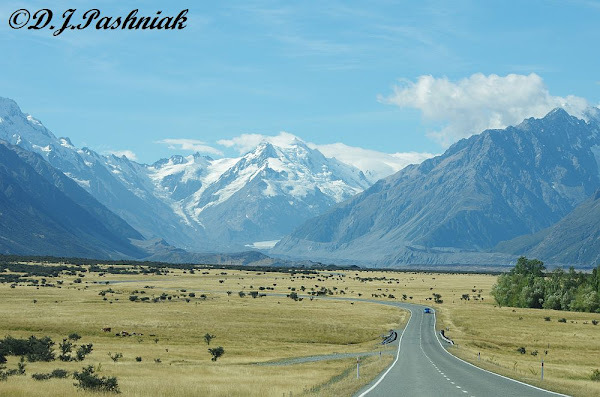 We left the flat land of the Canterbury Plains and gradually climbed up to the rolling land of the Mackenzie Country and further in to the mountainous land around Mount Cook. Lake Tekapo is fed with glacial water and the milky color of the water reflects the light back differently. 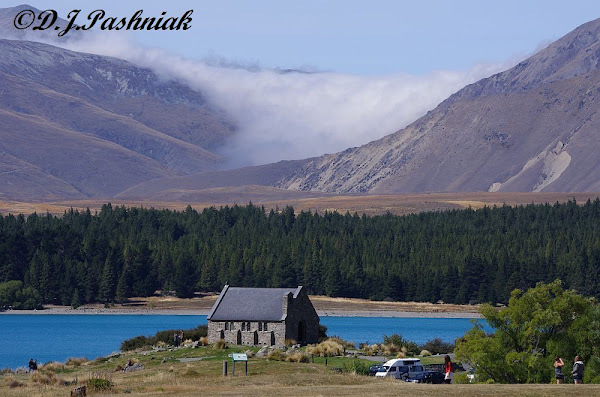 On the shores of the lake is a little church - the Church of the Good Shepherd - which was built to commemorate the pioneers of the Mackenzie Country. Instead of stained glass, the altar window is clear glass a gives a beautiful view down the lake. It seemed to be a favorite stop for tourists and tour buses. 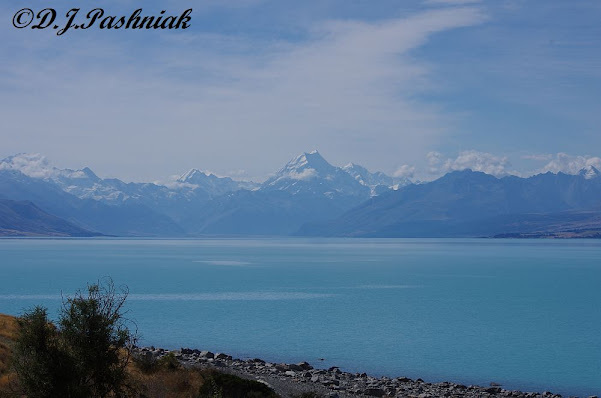 A little further on we came to Lake Pukaki ( another glacial lake) with perfect views down the lake to Mount Cook. 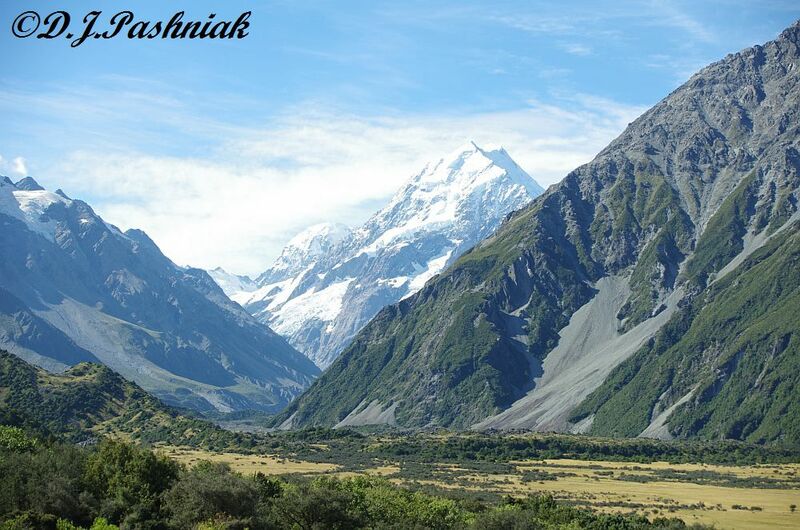 Mount Cook is New Zealand's highest mountain - 3,754 metres or 12,316 feet. ... and finally got as close as we could get without hiking. We were so fortunate to have clear weather! The last time we visited here (all those years ago!) the mountains were covered with cloud and we couldn't see Mount Cook at all. I remember looking up at the looming black hill above me (on the right of the photo above) and wishing I could even catch a glimpse of the mountain through the clouds. I haven't posted for a couple of weeks because I have been away on a holiday. 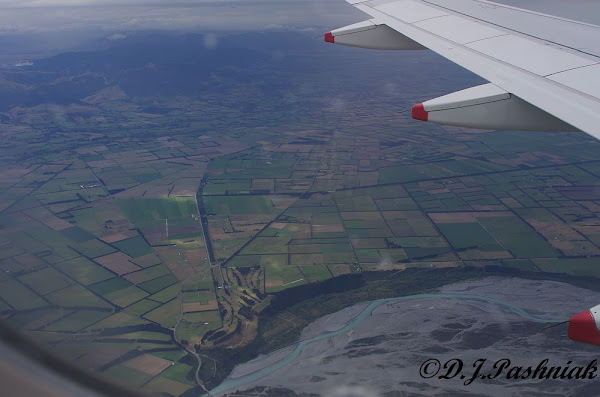 We had a great time - but - when we flew back into Brisbane I found I couldn't get home that day because of the floods. The Bruce Highway to Gympie was cut by flood waters in four places and the road to Tin Can Bay was cut in 6 places. 24 hours later and the roads were all passable but there was still a lot of water around. Now for the holiday - my sister and I had 10 days touring around the South Island of New Zealand. It was magnificent! But - not quite the way we remembered it. We last toured around with our parents 51 years ago and a lot had changed! As we flew into Christchurch we looked down on the patchwork landscape of the Canterbury plains. 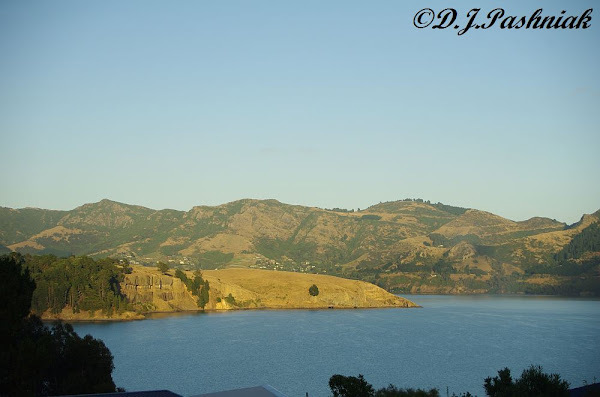 We picked up a hire car and immediately set off for our friends' place close to Diamond Harbour on the Banks Peninsular. 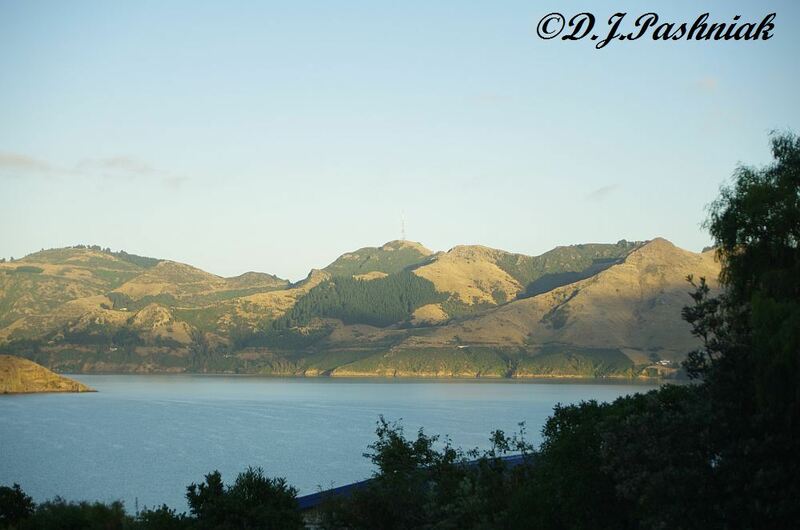 This whole area was formed by ancient volcanoes and the harbour is the old crater of the volcano. What could be nicer than sitting in the sun room at the front of the house and watching the sun set over the harbour - and then the next morning watching the sun rise! The color of the water and the light and shade on the hills was constantly changing. The next morning our friends took us around the bay a little further to where we could look over the harbour to Lyttleton. 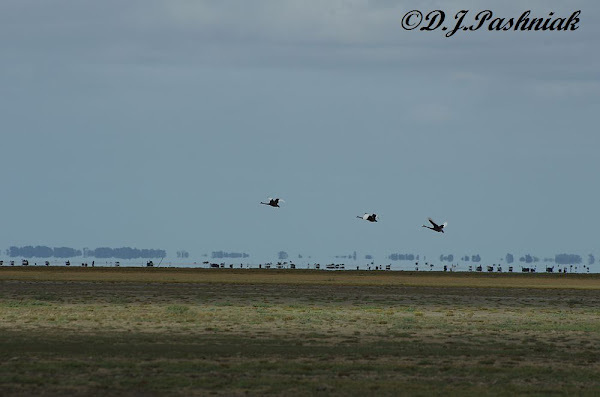 ...and down to Lake Ellesmere to see some birds. This area has been in drought conditions for some time and the water was further away than our friends had ever seen it. We walked out until we could see the birds strung out along the waterline - but decided we wouldn't go right out. 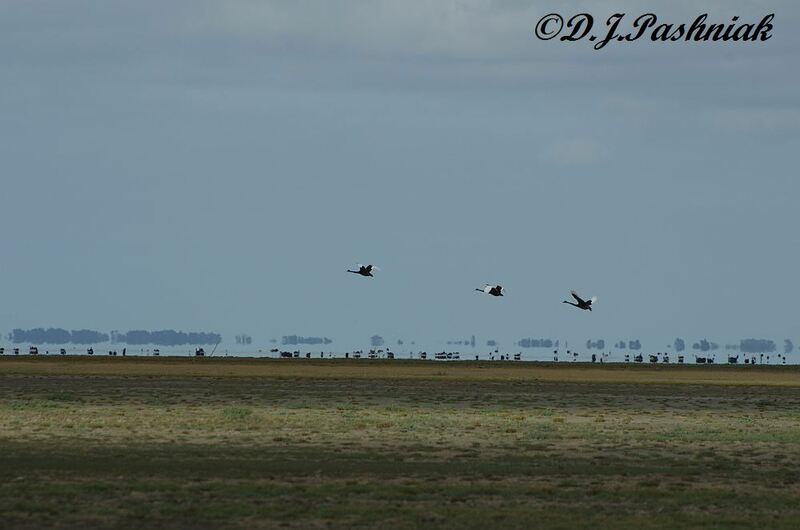 We could see lots of Black Swans and Ducks but I don't know how close the birds would have let us get as we were completely in the open and this is an area used by duck shooters. 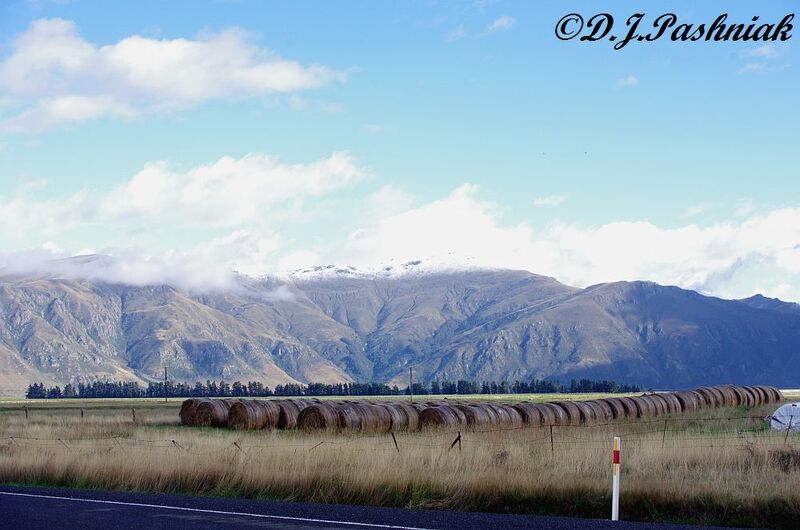 Our friends then provided us with directions for getting straight out to the main road south rather then going back in the long way to Christchurch again. Thanks John and Jackie for a perfect start to a wonderful holiday. Next time - the Mackenzie country and Mount Cook.